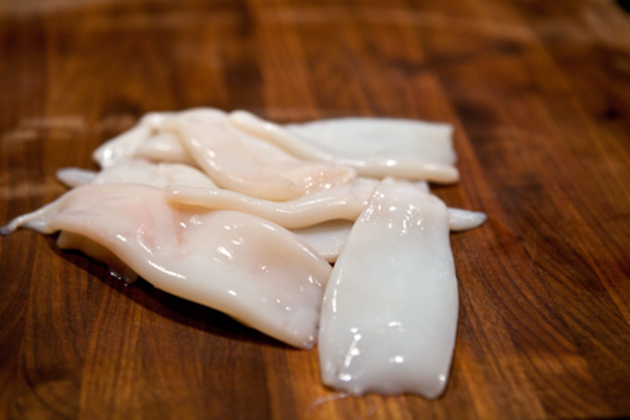 Clean and wash the squid, place in a steamer and steam for 10 minutes (Do not exceed the time otherwise the squid will shrink). Keep it aside. 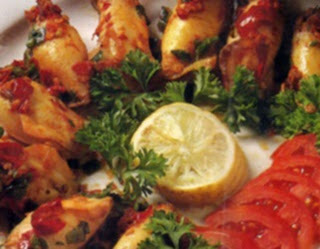 Cook the chicken breast with ginger, bay leaves, cinnamon stick, cloves and little salt. Shred the chicken breast. For the filling, heat oil in a pan and add garlic, when it turns light brown, add chopped onion and saute it. When the onion becomes transparent, add capsicum, celery, spring onion and saute for few minutes. At last add shredded chicken, pepper powder and salt. Saute again, remove from fire and mix well with mayonnaise. Fill each squid with the above mixture. Make a thin batter of gram flour, maida and salt with enough water. Dip each squid in the batter and deep fry. 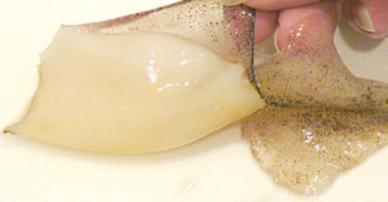 Note: Do not overcook the squid otherwise it will shrink. Cover the pan while the squid is being fried.